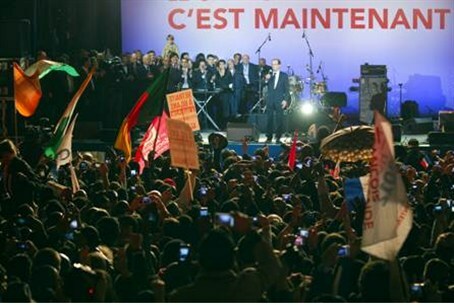 Palestinian Authority and Syrian flags were waved in a Paris celebration of Hollande’s victory. He promised to visit Israel. Palestinian Authority, Syrian and Algerian flags were waved in a Paris celebration of Socialist Francois Hollande’s victory over French President Nicolas Sarkozy. Thousands packed Bastille Square and broke out champagne bottles with shouts of victory. Hollande promised during his campaign he will visit Israel if elected and added he backs "two neighboring and sovereign states, each within its own legitimacy." Presumably, he also would visit Ramallah and meet with PA Chairman Mahmoud Abbas. He also said he is "totally opposed” to what he called illegal boycotts of Israeli products but did not specifically say if he considers goods made and exported from Jewish communities in Judea and Samaria as fair targets for the boycott movement. Left-wing parties whom Hollande may court for a coalition are steadfastly behind boycott efforts. Hollande also pledged to fight anti-Semitism, which has claimed the lives of several Jews in recent years. A rabbi and three young children were gunned down earlier this year at a Jewish school in Toulouse. “I will not let anything pass that could contribute to a climate that would isolate the Jews within their own country,” Hollande said during the campaign against Sarkozy, who lost the election on Sunday by two percentage points.